This patient presented with headaches and left-sided pulsatile tinnitus, having no other symptoms. 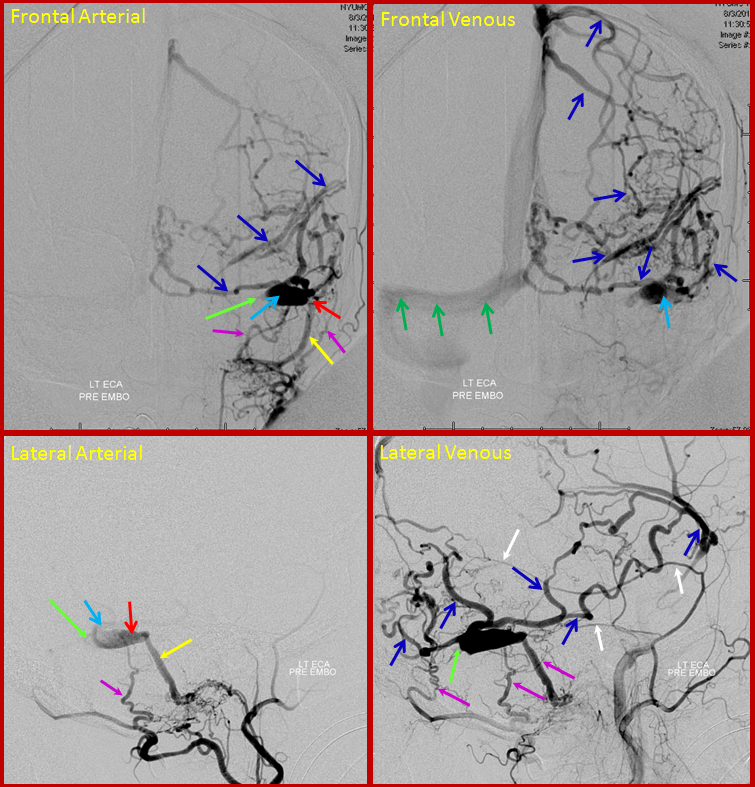 Arterial and venous images of left common carotid injection during diagnostic angiography show sigmoid sinus (light blue) single hole fistula (red) supplied by occipital and middle meningeal artery branches (pink), draining retrogradely into the transverse sinus (green). The ipsilateral jugular outflow is occluded. 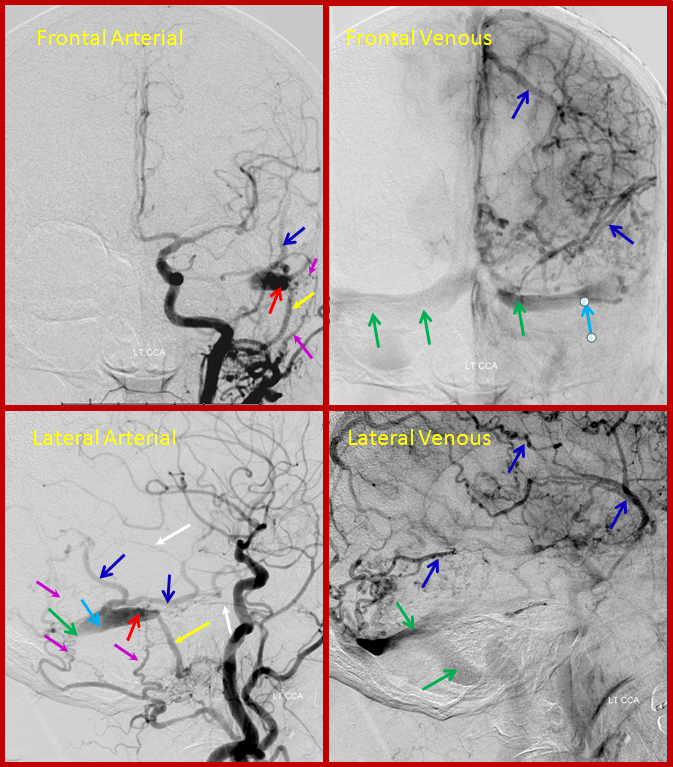 Extensive retrograde drainage into cortical veins is present (blue). This is a high grade fistula, reflective of brain venous congestion, at high risk of hemorrhage and other congestion-related issues such as seizures. The patient returned for treatment 2 weeks later, and reported that her tinnitus has disappeared. 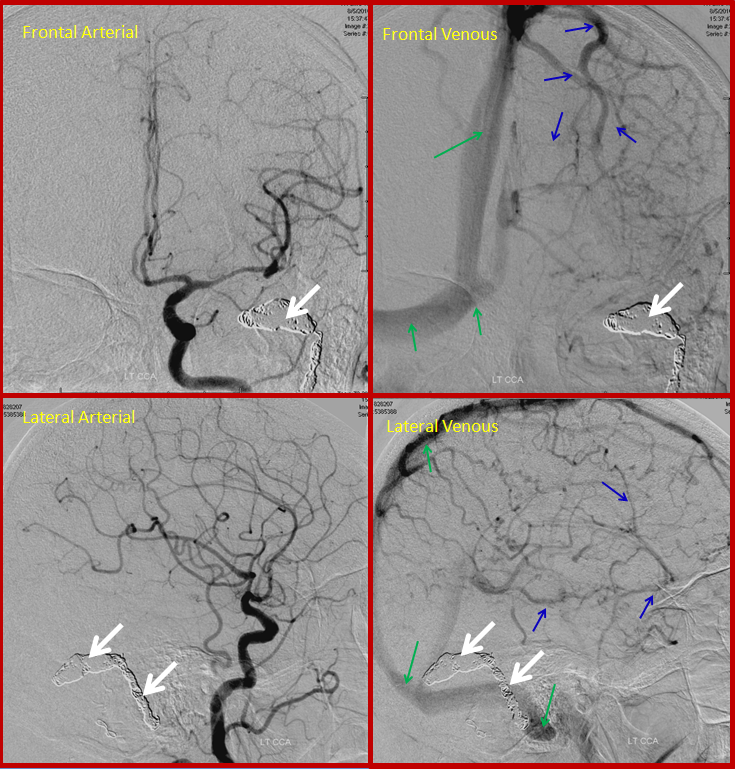 The pre-treatment angiogram, below, showed that the left transverse sinus proximal to the fistula has occluded (bright green arrow points to new occlusion), such that the fistula (red) empties into a short segment of the transverse sinus, and having now nowhere else to go, drains exclusively into cerebral cortical veins (blue arrows), which then in retrograde fashion opacify the torcula and right transverse sinus (dark green). We typically caution our pre-embo patients to contact us should their tinnitus improve, for this very reason.